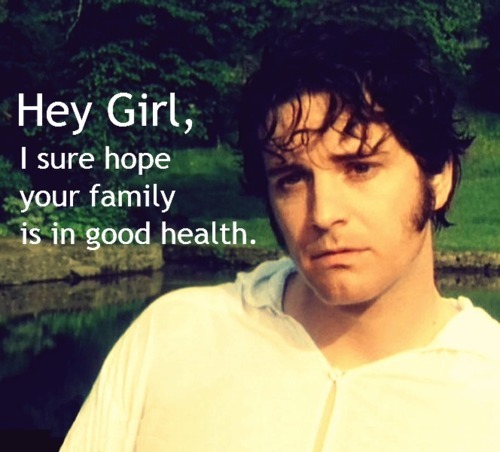 “Oh no, another chick who is crazy about Jane Austen,” you say? Yes. Yes, I am crazy about Jane Austen. My most prized possession is a 1975 London Folio Society box set of her complete works. I have read them all at least once, and most I have read more than once. Persuasion is my very favorite, though of course Pride and Prejudice is the acknowledged masterpiece. As anyone who loves costume dramas knows, there have been numerous dramatizations of Pride and Prejudice (some better than others, I suspect). Who could forget Bridget Jones’ Diary? (Yes, in case you didn’t know, that is based on Pride and Prejudice like Clueless is based on Emma.) The most recent film adaptation stars Keira Knightley and Matthew Macfadyen (not my favorite) and perhaps the most popular version (and what set off the latest Jane Austen craze) is the BBC’s 1995 TV adaptation starring Colin Firth and Jennifer Ehle. If this confuses you, look up Ryan Gosling and “hey girl”. Over the past year (since April 9, 2012), the classic has inspired the online YouTube series The Lizzie Bennet Diaries. I stumbled across this series via Facebook and spent almost an entire afternoon watching the 5-minute videos from the first episode. The vlogging (that’s “video blogging”) setting gets old pretty quickly (especially when you watch them all in quick succession), but it’s a clever and fun way to bring Pride and Prejudice to life for a modern audience. But what, you may ask, is it about this novel that makes it so enduringly popular? Many like to say it’s the romance. Even Henry James apparently complained at the end of the 19th century that people (read: women) were reading Austin for the romance. I have to admit that I was disappointed to read the BBC’s emphasis on the romantic side of the story in their coverage of the 200th anniversary. Austen’s novels, Pride and Prejudice especially, are more than romance novels or the origins of what naysayers call “chick lit”. They are, in essence, comedies, which in the Shakespearian tradition end with a wedding. They are far more subtle, though, than most comedies and chick lit. They are written with an undercurrent of social commentary and with fabulous wit, intelligence and insight. If you were to actually pick up Pride and Prejudice, you would immediately realize that Austen possessed an incredible understanding of human nature, and was blessed with the genius to convey her insights in engaging language. Who cannot sympathize when Elizabeth Bennet says, “Till this moment, I never knew myself”? Without being pedantic or preachy, Austen gives Elizabeth (and us) a lesson in self-understanding to which most readers can relate. So if up to now you have rejected Pride and Prejudice as “chick lit” or a romance novel, I encourage you to try reading the first three chapters (they’re short). Yes, the romantic story of love thwarted and then resolved is there, but it acts as a vehicle for so much more. Read it for the wit (because it really is funny), and read it as a testament to the value of good, strong understanding of self and others. And in case you were wondering, yes. I am re-reading Pride and Prejudice right now. Whee! My rating on Goodreads: 3 stars out of 5. I was disappointed by “Sea of Poppies” (2008) by Amitav Ghosh. Having read “The Glass Palace” (2000), I was expecting a novel of similar quality from “Sea of Poppies.” This book is set up as an epic novel, and while it is certainly epic in scope and in the number of characters it encompasses, I find it is also epic in its failure to give the reader any character of much value or substance. Its reach is too broad, and it is missing a central, strong character to tie it all together. I will start by saying that I did find the story gripping. Ghosh tells a good tale, and his ability to evoke landscape, color and space make it easy to picture the vivid fields of poppies, the slums of Calcutta and the desolate stretch of an empty ocean. That’s why I’ve given the book three stars: Ghosh knows how to place a cliff-hanger, and the novel’s got an exciting story. My main complaint, however, is how flat, one-dimensional and completely obvious the characters are. 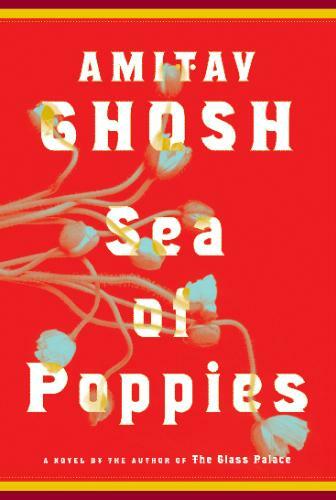 Ghosh leaves no room for interpretation of the cast of “Sea of Poppies.” They are very black-and-white, both in the good-and-bad sense, and, unfortunately, in the sense that white is bad and black is good. There is a clear distinction between the “good” and “bad” characters: all the English characters are brutes, sexual deviants, clueless matrons or gluttons while all the non-English characters are virtuous, unselfish and sympathetic. There are a few exceptions, including Singh and Deeti’s in-laws, and Paulette and her father, who, of course, are not English but French, and have integrated somewhat into local culture, learned the language and rejected the social mores of the dominant Brits. Now don’t get me wrong: I am not saying that the practices of the English as colonizers were in any way excusable, and I am not trying to apologize for colonization. Far from it. But a human being is a subtle and complicated creature, and his or her character is not so easily placed in a category of “good” or “bad” as Ghosh has so disappointingly done. The “good” characters are, predictably, the coolies, the lascars, the mixed-race second mate Zachary, the metamorphosing gomusta, and the disgraced raja. Bad and good characters, English and non alike, are portrayed as so flat as to make them completely unbelievable. This is in stark contrast to the character of Rajkumar in “The Glass Palace” whom Ghosh writes as so brilliantly complex and intensely real. We love him at times and despise him at others; Ghosh allows us that freedom. But not so with the cast of “Sea of Poppies.” We are told exactly how we are to think of each character, which completely killed any sense of interest or connection I had to this book. The one exception is Neel, the disgraced raja. I found him to be the most real of all the personalities portrayed: willfully blind to the folly of his business practices as raja, he is humbled in every way imaginable. His disbelief, defiance, rejection and slow resignation to his fate I found to be the most realistically human aspect of this novel. In this person, I saw some flickers of the brilliant characterization of which Ghosh is capable. These reasons, and the fact that I felt like “Sea of Poppies” left me with no better understanding of anything other than human cruelty, mean that I will not be continuing with this trilogy. This book had nothing original to say other than try to tell an interesting story. It felt like I was watching endless episodes of a soap opera, one in which none of the characters are particularly compelling. So I do not feel compelled to pick up book two in the series. If you’re looking for a good trilogy, check out the Cairo Trilogy by Naguib Mahfouz.